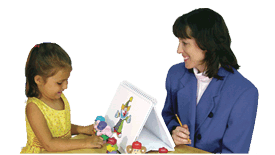 Response to Intervention (RTI) is an educational approach that provides evidence-based instruction to all students and identifies struggling students that may need alternative approaches before referring them to special education. It is an alternative to using standardized tests to identify students who need special education services. With RTI, students receive systematic instruction for a short period of time. A school team measures students’ progress before and after the intervention. The students that learn quickly and “respond to the intervention” need more instruction, not special education. Students who are not successful may require in-depth testing for language and/or learning disabilities (Montgomery and Moore-Brown, 2006). There are six beliefs behind RTI. All interventions (specific services) must happen early. Use more than one tier (level) of intervention. Use a problem-solving method when moving between tiers of intervention. Methods must be based on research or scientific evidence. Use data to make decisions about placement and intervention. When teachers and specialists talk about RTI, they refer to Tiers of intervention. They are actually talking about the level of teaching support that each student needs. This is important because not all students learn the same way. Most students—80%—fall into Tier 1. This tier includes students in the regular classroom that receive the same instruction (teaching techniques) as the general class. Intervention is the least intense for this group—teachers do not provide one-on-one instruction and extra accommodations are classroom-wide. Tier 2 consists of small group evidence-based instruction usually provided by the classroom teacher or teaching assistant. This is in addition to regular instruction. Tier 2 consists of about 15% of students. The students in Tier 2 need and receive more support than Tier 1 students. This support may include teaching in small groups, having parent-volunteer tutors, or posting visual schedules (giving the student picture cues to help lead him/her through daily activities). Throughout the process, teachers and specialists will also problem-solve, take data (keep track of correct and incorrect answers), monitor a student’s progress, and make decisions about the student’s placement into special education based on the data. That is, a student who makes minimal progress, even with all of the extra attention, intensive instruction, and accommodations, likely would benefit from special education services. Students that exhibit progress in Tier 3 may remain in the general education, but continue to receive Tier 2 services.